17-year old female Korean Go-playing star visits Oxford. On Thursday 6th April 2006, HaJin Lee, a new female star of the Go-playing world, is the guest of the Oxford City Go Club for a meeting in the Oxford University Department of Engineering Science, Parks Road, Oxford. The event starts at 7:30 pm (welcome from 7:00 pm), and will include simultaneous play, and game commentary, from HaJin Lee, and fellow Go professional, and TV presenter/commentator, HaeWon Han. We have details of the venue, how to get there, and parking. Go is the oriental board game, created in China (known there as WeiQi) about 4,000 years ago. It is widely played in the Far East. Korea, despite having a relatively small population, is producing many strong players when compared with China and Japan. Hajin Lee is Korean, was born 21-06-1988, and became a professional Go player only last year. Since then her progress has been rapid. She has beaten many strong players, including NaWei Rui (9 dan) – a Chinese professional player, and the all-time strongest woman Go player in the world. Rui is herself one of the world’s strongest players (once being ranked world #9), and has beaten the world’s strongest player. Hajin Lee is currently on a trip to Europe, as part of a larger group involved with the Korean Ambassador’s Cup for Baduk (KAC). She is making an informal visit to the UK with the well-known TV presenter/commentator HaeWon Han, who is also a professional Go player, and a member of the Korean Baduk Association (KiWon). There are two brief articles about HaeWon Han on the web -- at Sensei’s Library, and GoBase. 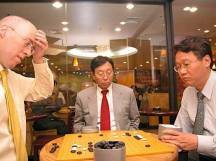 The visitors are in a group led by Prof SangDae Hahn, who is not only a strong amateur Go-player, but is also tireless in promoting the game in Korea, and abroad – largely through his involvement with both the Korean Amateur Baduk Association (KABA), and the Department of Baduk Studies, at Myongi University, Seoul, Korea. Myongi University was the first university to have a degree-level course in Go/Baduk/WeiQi, and also has postgraduate students. He is Chair of the organizing committee for the International Team Baduk Competition, and was the Chair for the International Conference on Baduk in 2001 (Seoul, Korea), 2003 (St Petersburg, Russia), and 2005 (Seoul, Korea). He has played a central role in informing the rest of the world about the extraordinary burgeoning of Go/Baduk in Korea in the last 20 years – this has included work with the KABA to create an accreditation system of International Baduk Instructors. Our Korean visitors have a busy schedule, which includes a special event in New Malden, organised by the New Malden Baduk Hall, at another venue in New Malden, on Wednesday, 5th April 2006. There is more information -- when, and where (with maps/directions). New Malden is becoming a focus for the growing Korean expatriate community in Britain, and the event in New Malden offers a good opportunity to strengthen ties between them and the rest of the British community. We hope that our visitors will find enough time to take in the tourist sights in both London and Oxford. 2005 was the first year for European (Korean Ambassador’s Cup) KAC events. This year the KAC has expanded, and it will include Australia. The first two European parts of the KAC for 2006 are in Berlin (25/26 March), and Paris (1/2 April) before their UK visit. HaJin Lee plays the winners of each of these (results?). The following weekend, the third European part of the KAC is being held in Leiden (8/9 April), Netherlands – Leiden is twinned with Oxford. It is expected that later KAC events this year will include ones in Finland, and Madrid. Korea has thriving specialist Baduk (Go) TV channels, including Baduk TV, with audiences of millions. HaeWon Han (2 dan professional) is 23, and is one of the new generation of players. She is a well-known, and popular, presenter and commentator. Recently, a major Chinese Go-playing internet site voted her the most attractive professional Go player. There are two Go Clubs in Oxford. The Oxford University Go Society was founded about 40 years ago, and has a long, if not always successful, friendly rivalry with the corresponding Cambridge Go Society. The Oxford City Go Club has existed for nearly thirty years, has close ties with the University club, and has a friendly relationship with the Go club in our twin city of Leiden. Coincidentally, Leiden is the venue for the upcoming Korean Ambassador’s Cup event. The Oxford City Go Club is affiliated to the British Go Association. A useful starting point for finding out more about the game of Go (known in Korean as Baduk, in Chinese as WeiQi, and in Japanese as Igo) is Sensei’s Library.